Q. 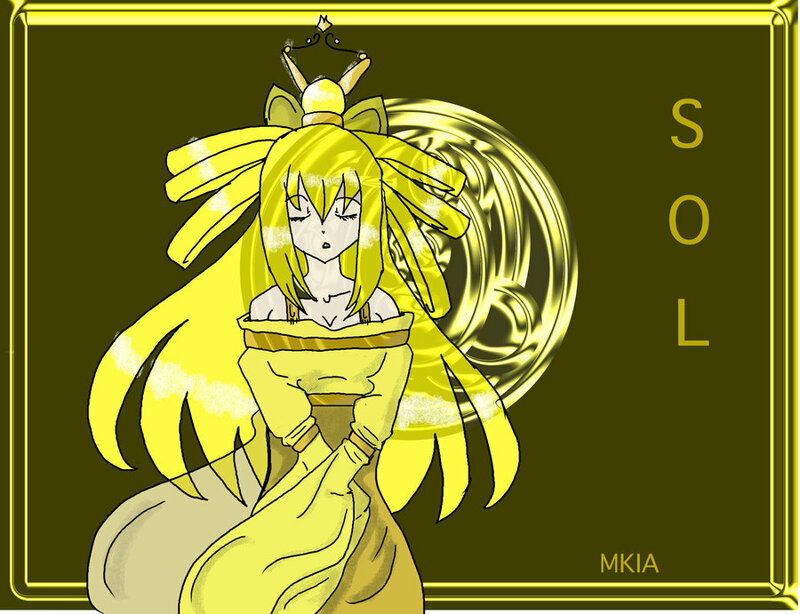 What does MKIA stand for? Miss Know It All. I came up with the name when I needed a screen name for some arts sites. People started calling me that because they call me a walking dictionary. Q. Tell me about the projects you're working on these days. I write and sing songs to a certain extent. I like to do visual arts of every type: sculture, pen and ink, scratchboard, and digital. I've dabbled in a whole bunch of musical instruments. I also write, mostly science fiction short stories, and I like to get a bit satirical. Q. 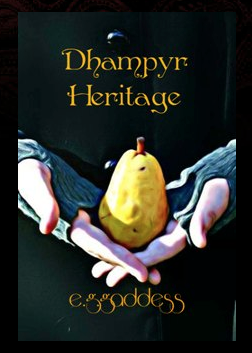 You created the cover for Dhampyr Heritage. Tell me about that process. Well, my mother wrote the book, so we worked together on the cover. She took the picture. 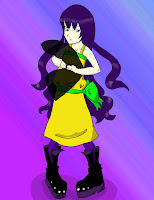 I figured out the clothing design and composition, and then played with it in Photoshop. The title, placement, and colors were my creation. It was lots of fun. Q. How did you come up with the image? We were poking fun at the Twilight covers, and there's a pear in the novel. I like pears; they taste good. Q. How was it working with your mother on a creative project? Working with my mother is a challenge. She knows me outside of my writing and creativity, and knows how to make me work harder on projects. She's also a lot like me, because we have a lot of the same ideas and world views. Sometimes it's hard to get new ideas flowing when we have the same ones. Q. Do you have any other collaborations or illustrations you're working on? I'm working with Karen Beardslee Kwasny, one of the writers in my mother's writing critique group. 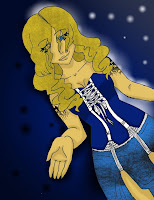 She has written a series of middle grade short stories that I am illustrating. Q. What do you see yourself doing in the next couple of years? I'm working on three stories in the next couple of years: one is a full novel, and the other two are sets of short stories that go together. My genre is what anime likes to call slice of life, and I dabble is science fiction, mostly futuristic cyber fiction. Q. I hear you that last week was a good one for you. Why? Well, I won second place for my scratch board at my high school art show. And a group of local Marines was at the school working with the NJROTC unit and asked me to work on a drawing for a T-shirt design. Q. Where can people find your work online? I have a blog (MsKnowitAll's Sketch Journal) and a Deviant Art page. MKIA looks like she's going to go places. It's nice to see how well she can speak for herself and good to see that her mom supports her efforts. Thanks for sharing!